Alessandro joined EU40 as Project Manager in January 2019. 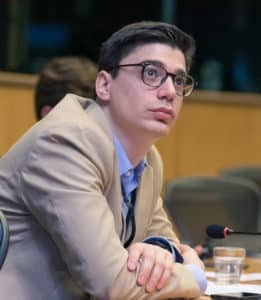 He has experience in energy politics, advocacy and European affairs, having worked for a Joint Undertaking of the European Commission focused on hydrogen for a sustainable future for two years. Alessandro holds a Master’s degree in Diplomatic Studies from the University of Economics of Prague, with a minor specialization carried out at the North Carolina State University in the United States. He is passionate about politics, beer and humanitarian aid. He worked as coordinator in-loco in different voluntary missions in India, Thailand and South Africa and is currently a Youth Ambassador for the ONE Campaign.